Here is the third, and final, installment of the survey of jobs and earnings by county. We have already seen that private-sector employment is down in almost every county; reluctantly, our state and local governments have slowly begun adjusting their workforces downward. That process, though, is neither fast nor big: the Government Employment Ratio (GER) has gone up and remains high across the state. In six counties, the GER is higher than 400; in three of those it exceeds 500! 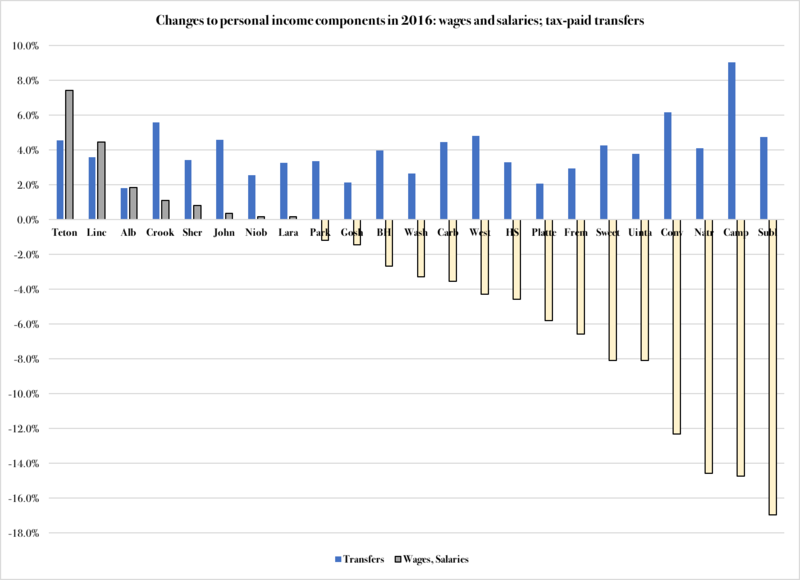 We have also seen how the dependency on tax-paid transfers has increased across the state. Today, we look at work-based earnings and numbers that confirm the conclusion from the previous two installments: our state has a weak tax base. 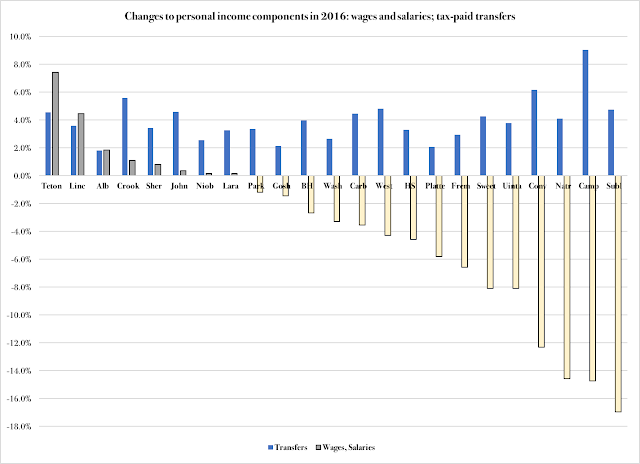 In only two counties, wage and salary earnings grew faster than transfer receipts. Total wages and salaries constitute the base for almost every tax imaginable; with rare exceptions, taxes on businesses fall back on the individual as well, directly or indirectly. Keep in mind that these numbers include both private and government employees. 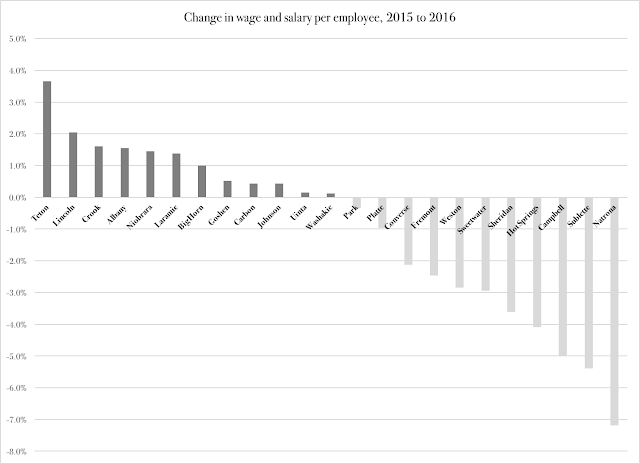 Also, please keep in mind that we have the largest government workforce in the country, and that it is the 11th highest-paid government workforce (relative the private sector). This makes the decline in per-employee earnings even more noteworthy - and worrisome. Again, we have not broken down the private-sector earnings by industry. This takes more time, but I will return with those numbers when I can take a stretch of time off and focus on that alone. For now, let us reiterate our conclusion: our state's hard-working families cannot afford higher taxes. *) There are still those who try to claim that Wyoming is the most rural state in the country, and therefore we need our big government. Not only have I refuted this argument, but I have also shown that other, equally or more rural states have smaller governments. Yet the rural-state pundits do not give up. A new argument that has surfaced is that Alaska is not more rural than Wyoming because the state has large areas of "designated wilderness", i.e., federal land you are not allowed to build on. But they forget to mention that the federal government owns something like 42 percent of Wyoming. If we use the argument that federal lands should not be counted toward a state's rural status, our population density suddenly jumps by more than half. It is now comparable to the Dakota states. That, however, still does not explain our big government: South Dakota's GER is 190, North Dakota's is 210. Ours is 305, which means that we have a 50-percent larger government than they do.